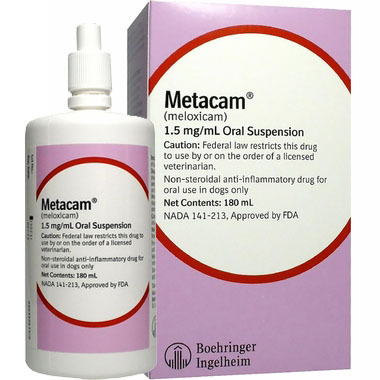 METACAM Oral Suspension is easy to use. Whether your dog is a few pounds or 120 pounds, liquid METACAM enables you to give them the most precise dose. 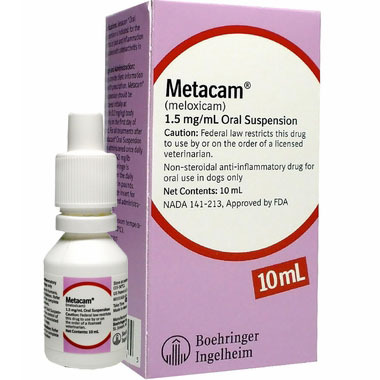 METACAM Oral Suspension is available in 2 concentrations and 6 different bottle sizes that help owners get the most out of each prescription and keep treatment as economical as possible. For large dogsUse the syringe supplied with the 1.5 mg/mL METACAM bottle. This syringe fits directly onto the METACAM bottle and is calibrated in pounds. Draw up the prescribed amount of METACAM into the syringe based on your dog's body weight and dispense either onto your dog's food or directly into his or her mouth. For dogs less than 10 pounds, administer each dose onto their food, not directly into the mouth. For dogs less than 5 pounds, use the dropper bottle (not the syringe) to measure one drop for each pound of body weight onto their food, not directly into the mouth. 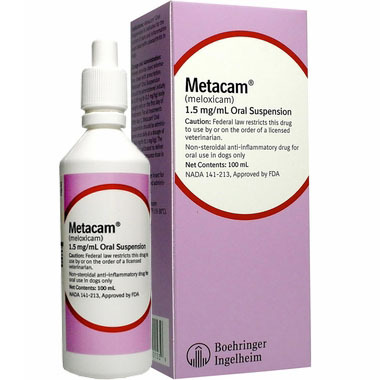 For small dogsIf your dog was prescribed the 0.5 mg/mL concentration of METACAM designed specifically for small dogs, you should administer two drops per pound of body weight onto your dog's food directly from the calibrated bottle tip per your veterinarian's instructions. Or, using the measuring syringe, draw up the prescribed amount of METACAM into the syringe based on your dog's body weight. The suspension may then be mixed with your dog's food or placed directly into his or her mouth. For dogs less than 10 pounds, administer each dose onto their food, not directly into the mouth. For dogs less than 1 pound, use the dropper bottle (not the syringe) to measure each dose onto their food, not directly into the mouth. 2. Turn the bottle upside down. Pull the plunger out until the black line on the plunger corresponds to the dog's body weight in pounds. 3. Turn the bottle right way up and with a twisting movement separate the dosing syringe from the bottle. Follow your veterinarian's instructions closely regarding what dose to give and how it should be administered, since this can vary with the weight of the dog. This is especially important for dogs weighing less than 10 pounds. 4. 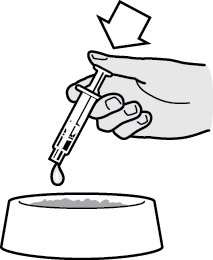 Push the plunger to empty the contents of the syringe. For dogs weighing less than 10 pounds, administer only on the food. 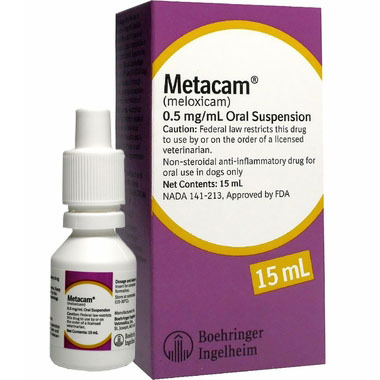 While using Metacam, talk to your veterinarian before giving any other prescription or over-the-counter medications to your pet. 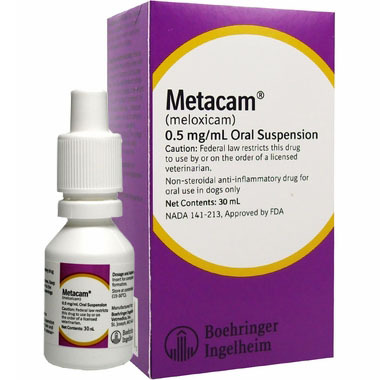 Metacam should not be used in the last third of pregnancy or with nursing animals. Don't use in animals with heart, kidney, or liver disease. ​Contact the veterinarian if the pet has bloody, black or tarry stools, blood in vomit, swelling or rapid weight gain due to fluid retention, unusual fatigue or weakness, yellowing of the eyes, excessive itching, abdominal pain or tenderness as these symptoms could indicate serious side effects. Warning: Repeated use of meloxicam in cats has been associated with acute renal failure and death. Do not administer additional doses of injectable or oral meloxicam to cats. Before giving your pet any prescription or over the counter medications check with your veterinarian or pharmacist. 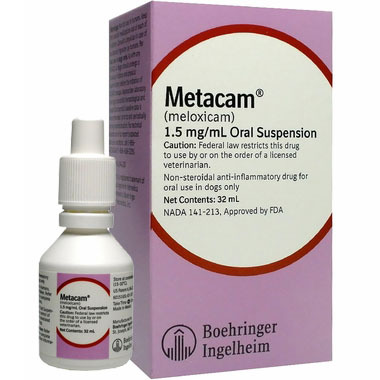 METACAM is a registered trademark of Boehringer Ingelheim Vetmedica GmbH, licensed to Boehringer Ingelheim Vetmedica, Inc. All product and company names are trademarks™ or registered® trademarks of their respective holders. Use of them does not imply any affiliation with or endorsement by them.